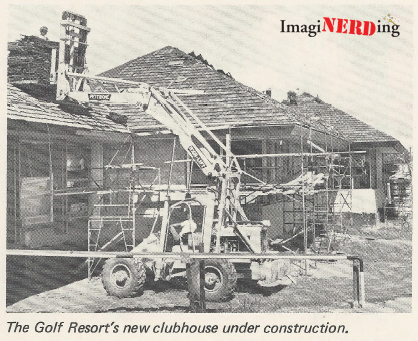 The Golf Resort at Walt Disney World has a very unique history. With the history of theme parks, it’s obvious that I’m a sucker for Disney ephemera. Not just typical ephemera either (like maps, brochures, napkins, etc), but ephemera for the Disney that’s no longer around. A primary definition of ephemera is anything short-lived. For intents and purposes here at ImagiNERDing, I will use ephemera to refer to Disney attractions, resorts, shops and restaurants that are no longer around. 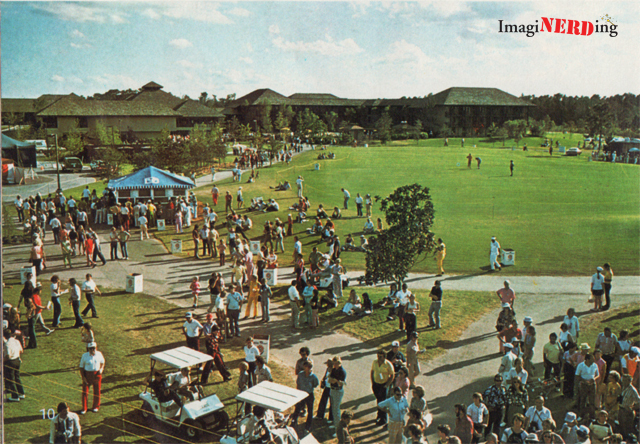 The Golf Resort opened in 1973 and it was the third resort at Walt Disney World. It was off the monorail loop, but still considered adjacent to the Magic Kingdom. It’s an interesting piece of Walt Disney World history because it wasn’t pushed as much as the more showy Contemporary and Polynesian Resorts. Both of those were showcases of the property and received a lot more press. 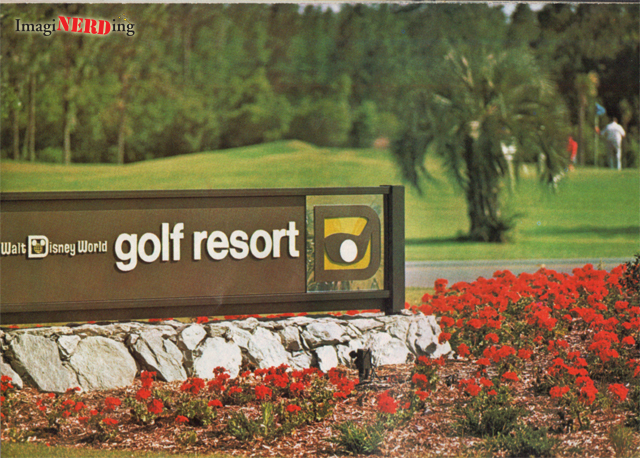 The Golf Resort was officially dedicated on December 15, 1973 and opened with 151 rooms. The Players’ Gallery was also available for relaxation after a strenuous day of golf (or visiting the Magic Kingdom) and included drink specialties such as: Double Eagles (Kahlua, Amaretto and brandy blended with cream); Lateral Hazards (sangria, triple sec and rum); Strawberry Colada Bogeys (rum, strawberries, pineapple juice and cream of coconut); and Duffer’s Delight (brandy, triple sec and orange juice). The Tournament Room was available for functions for up to 40 people. 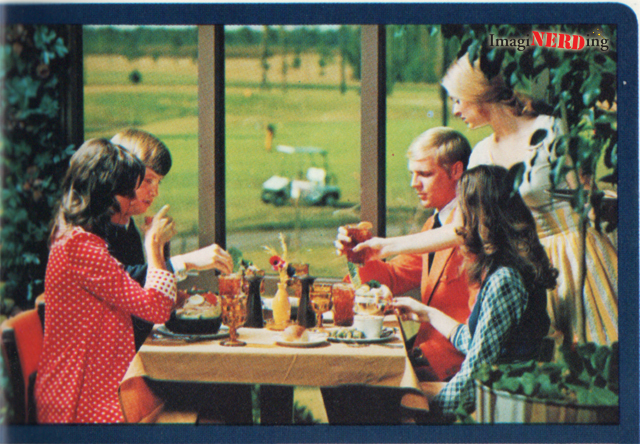 The dining services at the Golf Resort were always favorites of Walt Disney World executives. Not only were the lines much shorter than the Polynesian, but many of the executives were huge golf fans. 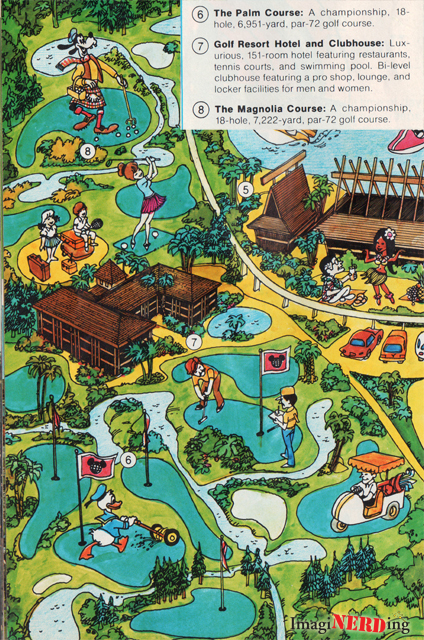 The above map was featured heavily in various Disney publications (like The Story of Walt Disney World and Vacationland) in the late 1970s and mid-1980s. 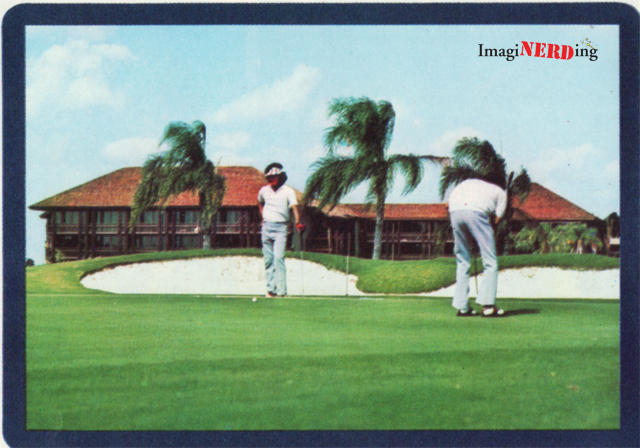 The Golf Inn was surrounded by two 18-hole, par 72 championship golf courses, the Palm Course and the Magnolia Course. 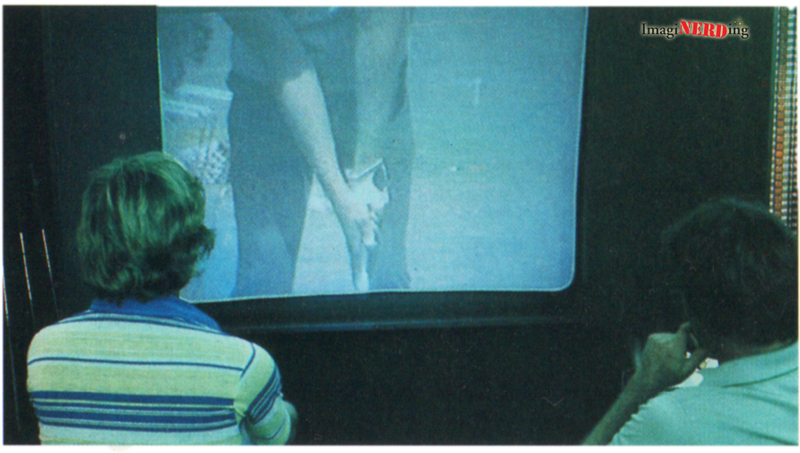 The image above is from the 1977 edition of the amazing Story of Walt Disney World Commemorative Edition. You can see how remote the resort is from the rest of the property and the two golf courses that surround it. 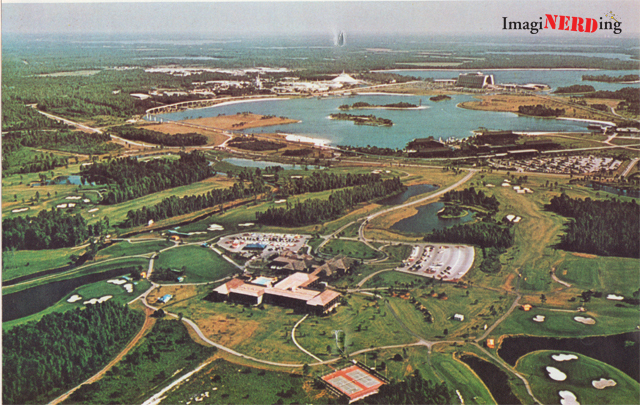 Even though the Golf Resort never found it’s true identity, like the Contemporary and Polynesian resorts, it would be expanded over the years to almost double its room capacity. 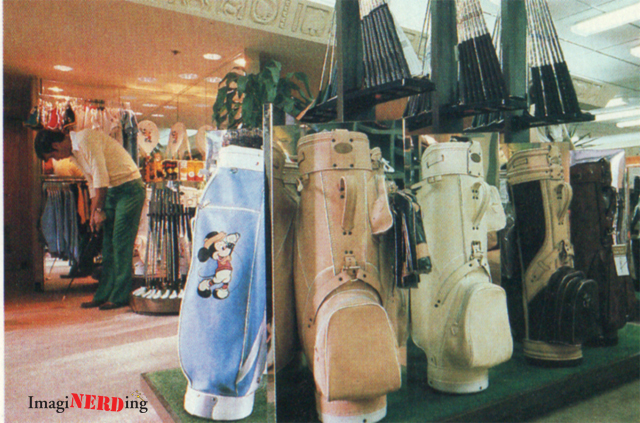 The resort also included the Pro Shop, which carried a full range of golf, tennis and leisurewear. In addition to sports equipment and accessories, the Pro Shop would also feature some cutting-edge video technology in relation to golf lessons. Golfers could sign up for the Golf Studio and have their swings videotaped and analyzed and critiqued by a golf professional. You actually received a personal audio cassette that restated suggestions offered from the program. 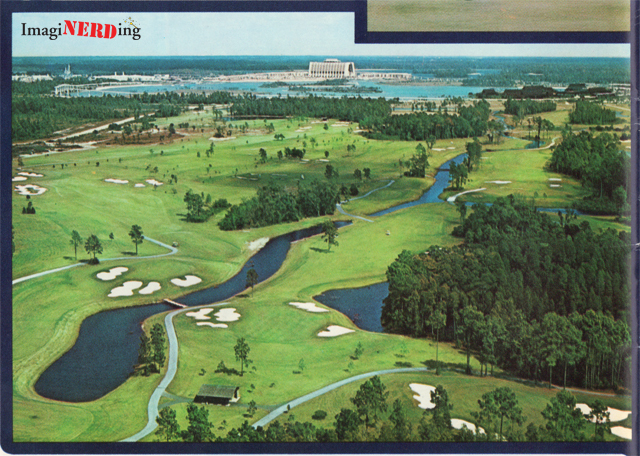 The resort also featured Wee Links, a 6-hole, 23-acre course that debuted in 1980. It was designed for teaching youngsters and included, for a nominal fee: rental equipment, one lesson and unlimited use of the course . 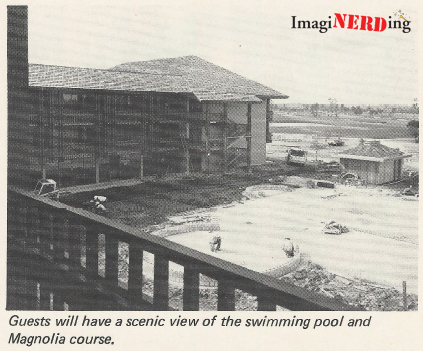 The Golf Resort was originally planned to be a country club, where guests could play during the day, while staying overnight elsewhere in the Vacation Kingdom. However, due to the interests of golfers in having a resort world of their own, hotel accommodations were added in 1973. Today, the cozy wood and volcanic-stone clubhouse features 151 guest rooms, each with a pleasant view and enough peace and quiet to soothe even the most savage duffer. Walt Disney World the First Decade, p. 117. Though the rooms here look about the same as those at the two sister Disney hotels, they’re actually a few feet larger. Decorated in subtle earth tones, the Golf Resort also has a pleasantly relaxed atmosphere-more akin to that of the Walt Disney World Village Villas. But the Golf Resort is miles more convenient: buses make the short trip between the Golf Resort, the Polynesian Village, and the Transportation and Ticket Center every ten minutes or so. I’ve not seen any photos of the interior of the Golf Resort. Does anyone have any they can share? 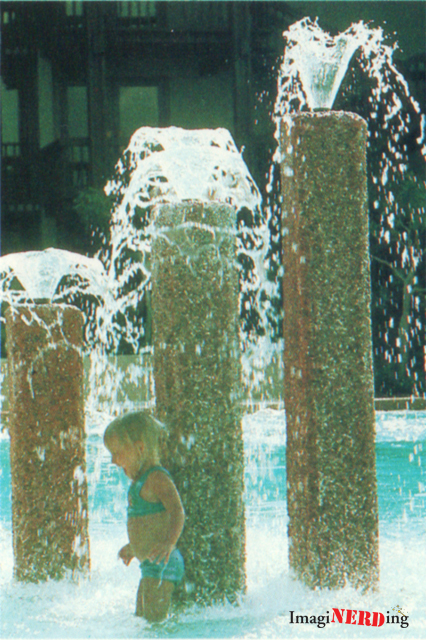 The resort included a 60 foot swimming pool with the odd architectural feature/splash area. There was also mention of The Out of Bounds, an employees’ snack and break area which was completely glassed in and was to give a view of the Magnolia Course. Anyone have more information about The Out of Bounds? 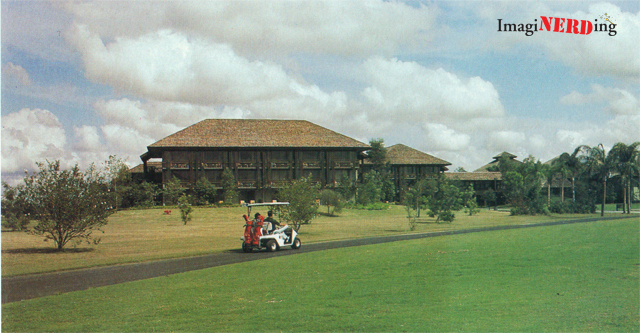 One of the perennial golf tournaments held at the Golf Resort. I posted most of the images that I’ve been able to find in official publications from the first fifteen years. 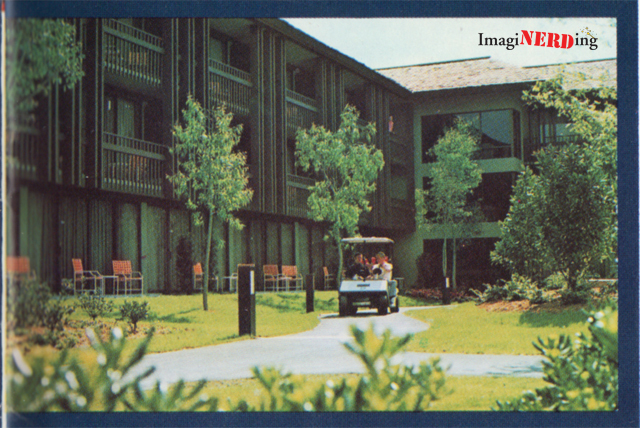 The Golf Resort would go through a major change that includes additional rooms and a name change in the mid-1980s. 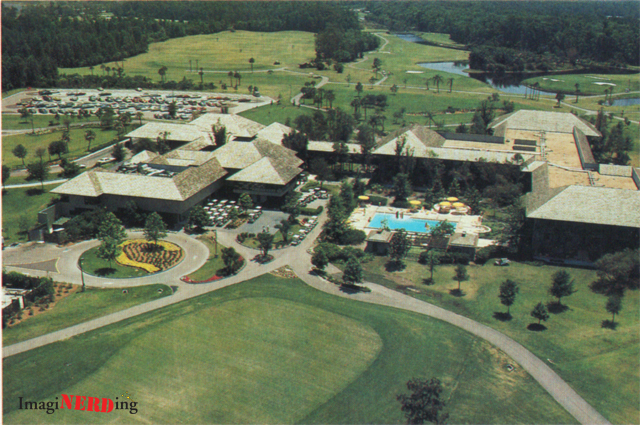 Did you ever get to experience the Golf Resort? Do you have stories or photos you can share? Any more information about The Out of Bounds employee break area? Huh, it had a name?! Out of Bounds was located to the extreme right front corner of the first building and connected to the Trophy Room/Multifunction space. It was very small but pleasant, often fancy surplus food from the Trophy Room was available which really made for a special lunch. This was an interesting read. 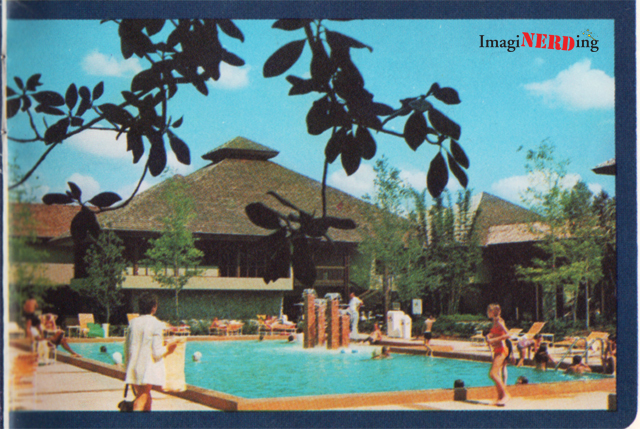 We stayed there (and also when it became The Disney Inn) a few times as kids. I don’t have any distinct memories of the resort. It doesn’t stick out in my mind like memories of the Poly and Contemporary do.